Memory, authorship, identity, productivity, privacy and consumption are all changing. The digital society is transforming our traditional relationship to these concepts, enhancing some and alienating others. Can artists help us navigate and respond to this new reality? Is society even looking to artists to help make sense of the transformation? Or has the Digital Age moved beyond a need for artists? Are we not all artists now? Are machines and algorithms our artists and arbiters of taste? How will we find meaning in this brave new world? Digital Transformations brings together thought leaders in the arts, in business and technology, education and journalism to share their views on the digital society and the meaning and value of the arts in such a society. It is a showcase for artists who have begun to address these issues in both traditional and non-traditional forms. Find out what the digital society really is from the people that are making it happen. Meet, listen to and talk with artists who are making the digital society a part of their work. Find out the ways in which creativity is currency in a digital society. Explore the future of creativity with artists, journalists, publishers, policy makers, educators and technologists. The conference is designed to welcome anyone who wants to take a new perspective on the coming digital society. Anyone who takes an interest in the arts, in creativity, in innovation, and who wants understand the many ways the digital society will affect the lives we lead will come away with new and useful perspectives. Artists, educators, journalists, curators, content producers, entrepreneurs, and policy-makers will all find something new, interesting and valuable to take away from this conference. 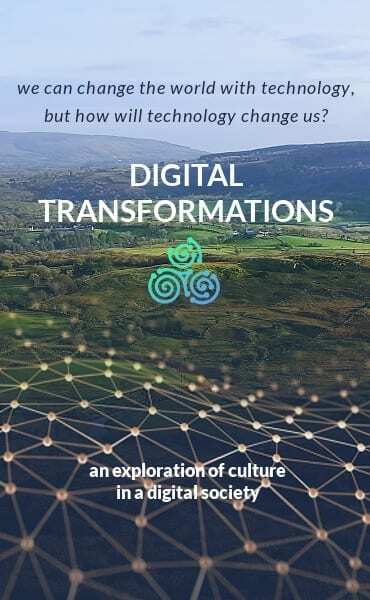 Digital Transformations is a conference bringing together 18 speakers from Ireland, the UK, the Netherlands, Germany and the US, including practicing artists, technologists, leading cultural curators, academics and educators. It is a forum for radical thinking, inspired by the idea that the arts should be leading our transition to this new, profoundly disorienting society – but ironically this new society is one in which art as we know it will struggle to retain its power and influence. Digital Transformations is built around talks, panel discussions, and break-out sessions where attendees can get involved in the debate and formulate a manifesto for the future. Evening entertainment will be provided by the ever-popular trio of Seamie O’Dowd, Kieran Quinn and Joe Kelly.